We are one of the leading providers of equipment rental services in Europe. Our equipment rental services comprise a full range of machinery and equipment as well as related services. Through the Cramo Rental Concept, which includes a network of 301 depots and an e-commerce solution, we provide a wide variety of rental services to construction companies, the manufacturing industry, the public sector and private customers in Finland and Scandinavia as well as in Central and Eastern Europe. The increasing volume of construction and the level of industrial investments are key growth drivers for equipment rental. In addition, the benefits of sharing, technological advances that lead to a higher cost of ownership and the need for comprehensive solutions and service concepts affect demand. We are the leading modular space provider in the Nordic countries. We offer high-quality temporary space solutions as turn-key project deliveries for varying rental periods. Our solutions are divided into four segments: schools, daycares, office space and accommodation. We serve both the public and private sector and operate in the Nordic countries, Estonia, Lithuania and Germany. Modular space solutions are provided under the Cramo Adapteo brand. 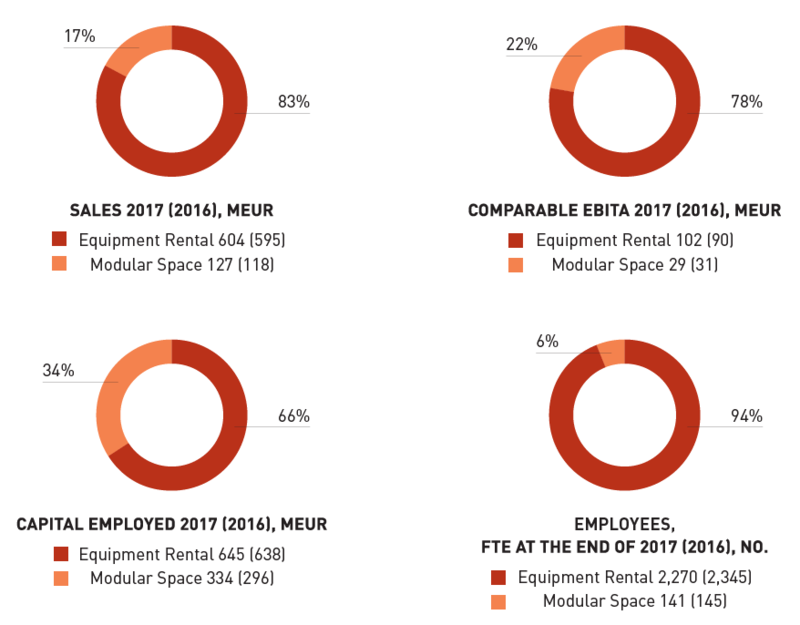 The modular space business growth drivers include fluctuating space needs for different functions in society and growing demand for office space as a result of greater economic activity.